In July, The Center for Investigative Reporting released the open-source code for the tool we use to measure our influence, the Impact Tracker. Since then, many have asked how to use the platform and how other organizations are using it. The Impact Tracker is an interactive database. Your staff can create records for all the real-world change associated with your work. For this to be useful, your organization first needs to set impact priorities and socialize these throughout the newsroom so everyone knows what counts and should be entered. For example, for many investigative newsrooms, the gold standard for impact is structural changes such as policy reform, power-holder response, government investigations or corporate restructuring. So each time something on this list of changes happens, a reporter or editor completes a simple web form to create a record of the impact. We think of these as macro changes. But there are many types of more nuanced impact that also are important to document to get a deeper understanding of broad processes of change. For example, news organizations may be interested in documenting when an advocacy or community organization uses their content as evidence of strengthened community networks (meso) or documenting each time they receive an email from someone in the audience saying he or she learned something new (micro). Whatever your goals, they fit within the impact framework we’ve developed, and the Impact Tracker can be customized to reflect your organization. Once your team has begun to enter outcomes into the Impact Tracker and the qualitative dataset begins to grow, you can use the filter function to slice and dice the data however you’d like. For example, organizations using the Impact Tracker often say they compare impact by topic and by time period. And the interactive timeline function makes it easy to see patterns over time. If you’re telling a story – investigative, explanatory or daily news – and something happens afterward as a result of this reporting, your audience wants and deserves to know. The Impact Tracker provides a simple way to keep track of the discrete moments during which impact happens and to string them together into a more holistic narrative of change. And when things happen, be they small or large impact, they provide fodder for social networks and a way to engage your communities around positive change associated with your work. This boosts your relationship and trustworthiness among your communities. For nonprofit media – and increasingly for commercial media, too – grant writing and reporting is a fact of life. 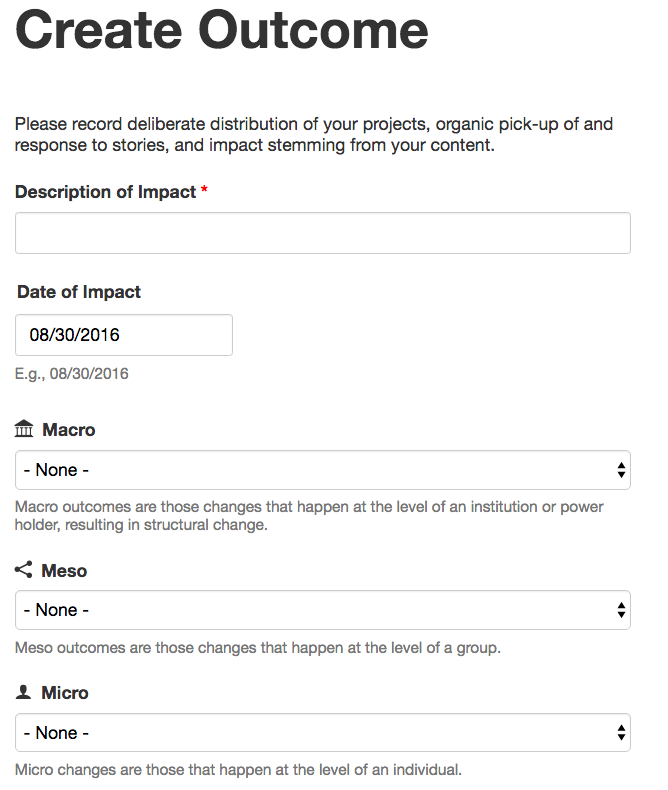 The Impact Tracker eases workflow by creating a central repository where all staff can drop in instances of impact that those responsible for grant writing and reporting can access easily. Interpersonal communication then can move beyond “URGENT: Need impact” emails to more concrete questions about the how and why of specific outcomes. In a media environment where innovation is necessary and content can be produced on countless platforms, it’s more important than ever to know what works toward what end and under what conditions. Which partnerships consistently result in macro structural change? Which topics or beats strengthen community networks? When does an animated explainer lead to greater audience knowledge of an issue? For example, CIR used qualitative data from the Impact Tracker with our online metrics for our Dark Side of the Strawberry investigation and found that while our partnership with The Guardian drove much traffic to the story, it was a local partnership with the Ventura County Star and on-the-ground community engagement that resulted in substantive community activation and, ultimately, policy change. By using your qualitative impact data with your quantitative metrics, you can focus your strategy and more effectively allocate resources. Lindsay Green-Barber can be reached at lgreenbarber@cironline.org.